By dusk last night we had three narrowboats breasted up across the river. 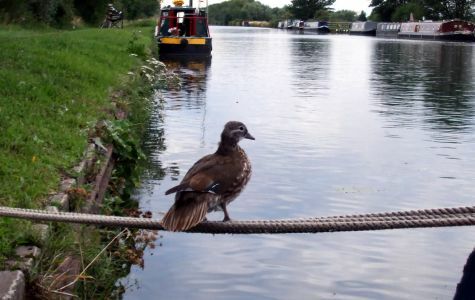 Another had turned up looking for a mooring, and was invited to join us. 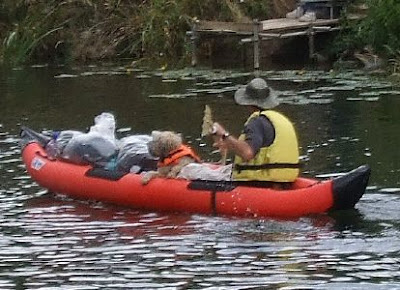 It’s perfectly safe while the river is low and sluggish, but definitely not recommended in fast flow conditions. Too much strain on the mooring posts and lines of the innermost boat. Got chatting to Bob and Aileen on NB Petrino last night. It turns out they moor at Thurmaston, just north of Leicester, and Bob and I seem to be related, somewhat tenuously, going back to our Grandmothers. Small world isn’t it. 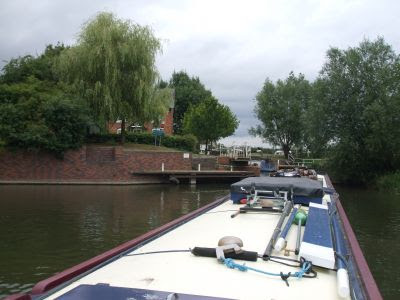 We travelled the short distance into Evesham today, sharing Chadbury Lock with Petrino on route. In Chadbury Lock As expected, Evesham is busy on a fine day. River trips, day boats hire boats and cruisers were zipping up and down this afternoon, but it’s quietened down a bit now. Gives a whole new meaning to “doggy paddle”, doesn’t it. 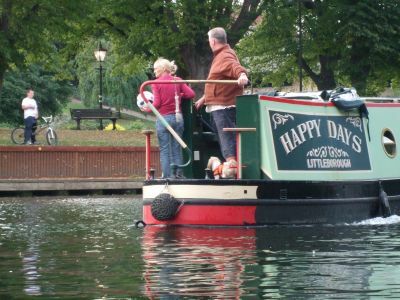 We moored opposite Abbey Park, where lots of Eveshamites were out enjoying a warm Saturday afternoon. The river from Workman’s Bridge, we’re in the middle distance on the left. This bridge is named for Henry Workman, who raised the funds to have it built, in 1865. Two earlier bridges were destroyed during the Civil War. 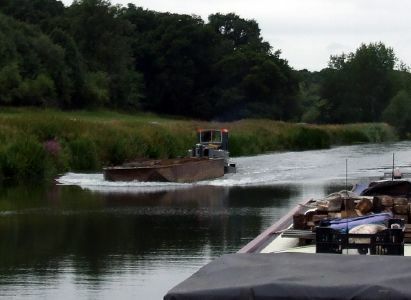 Dredging to clear the channel to navigation was used to construct the Workman Gardens, near where we’re moored. 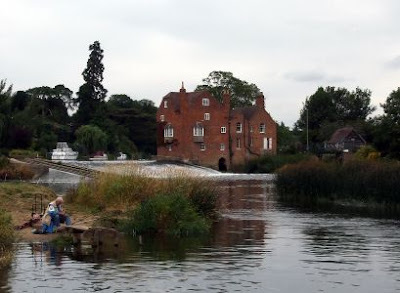 The town has always been prone to flooding, built as it is in a loop of the river. 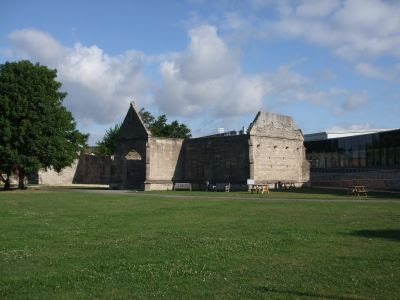 The town has also been of strategic importance. 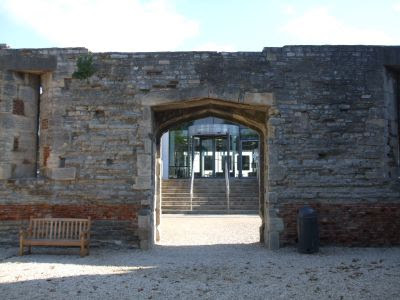 In 1265 a major battle was fought here between forces led by Simon De Montfort, Earl of Leicester, and supporters of King Henry III. This clash effectively ended the Second Baron’s War, a civil war in which the Barons attempted to curtail the power of the crown. Although De Montfort was defeated here, the war led to the birth of our modern Parliamentary system. Just sat here typing with the side hatch open and heard a shout from across the water. A bunch of lads on the park had kicked their football into the river. 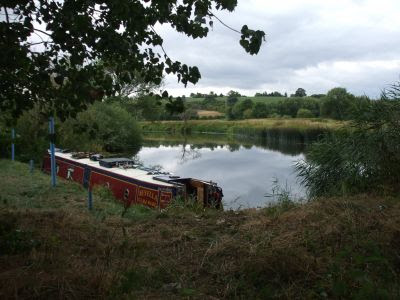 They were lucky, a passing narrowboat was on hand for the recovery operation. Yesterday was a bit disappointing, grey and gloomy. Today, although still overcast, has been warmer and brighter. 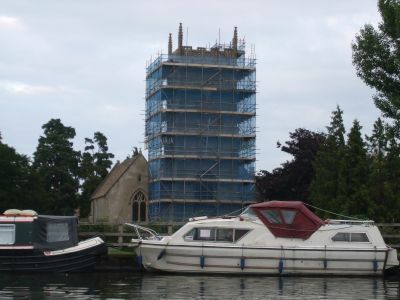 We were on the move at 09:00, with just 15 minutes to go to Nafford Lock. 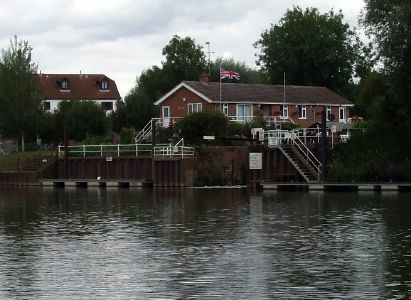 Approaching Nafford Lock, with the sluices on the right. 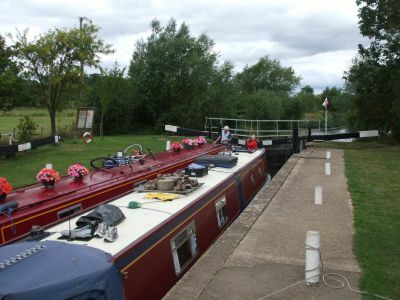 An inconsiderate wide-beam is moored on the left hand landing, making it difficult to pull in. A couple of boats had passed before we got away, so I had to empty the lock before we could use it. One of the “rules of the road” is that exit gates are left open, handy to get on but a pain for a following boat. 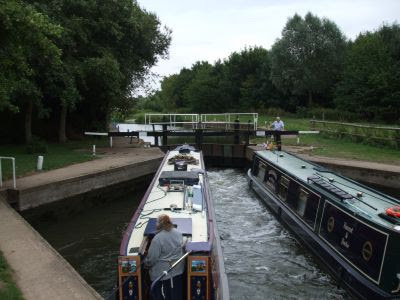 We followed a boat at every lock today, so all of the upstream gates had to shut first. There were signs at the lock advising of commercial boats operating between here and Pershore. They were carrying earth from an excavation just above the lock, a new marina maybe? Push Tug Scouser returning an empty pan. The Comberton Quay moorings look very quiet but I reckon TV would be a problem. 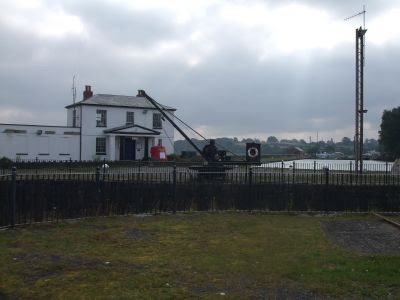 Comberton Quay. Approaching Pershore there are two road bridges to negotiate. The guide says that these can be tricky if there’s a lot of “fresh on”. I can see why, they don’t lie at right angles to the river, are at different angles and are close together. A potentially awkward situation. No problem today, though. Very little flow in these dry conditions. Following the bridges is the very pretty lock. 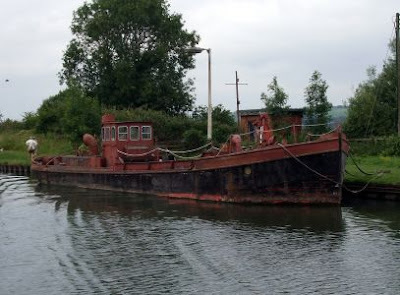 I’d just emptied this one for us when another boat arrived, NB Narrowboth from Middlewich. So we were able to share the lock and the work. 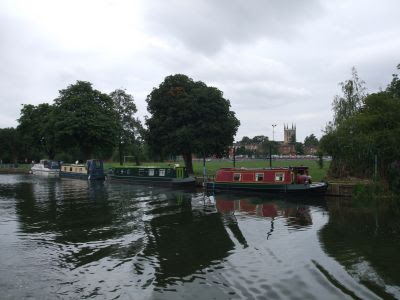 The moorings at Pershore look good, easy access to the town and the Asda supermarket. 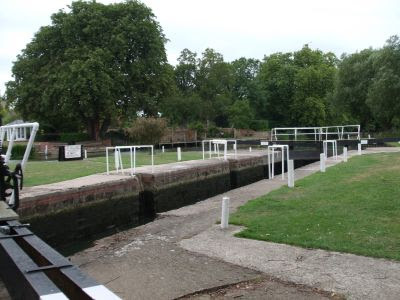 Only a mile further up the river is Wyre Lock, with it’s unusual diamond shaped chamber. You could actually fit three shortish narrowboats in here, with care. Want an unforgettable address? Buy a house in the village of Wyre Piddle. Just above the village the river branches around two small islands. On the left is Osier Island, named for the willows that grow on the banks. The other is Tiddle Widdle Island. Any ideas? 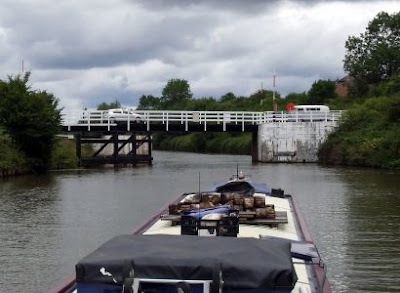 After Wyre Lock there’s a 4½ mile long stretch, winding along as rivers tend to. We’d intended to stop at Jubilee Bridge, a mooring spot identified on our Nicholson’s Guide, but this turned out to be a private garden, so we pushed on to Fladbury. 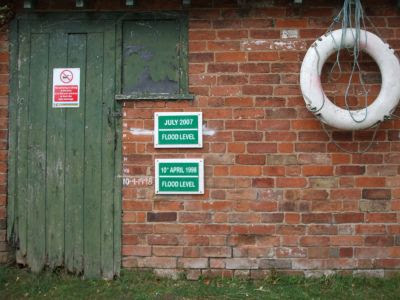 Flood markers at the lock side. We pulled over for the night at around 14:00 at Craycombe Turn. Although it’s alongside a main road it seems to be popular. 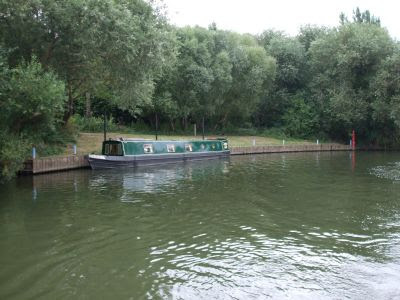 A boat was just pulling off as we arrived, leaving us room, and the mooring is full now. Overfull in fact. We’ve NB Petrino breasted up on the outside. We’ve seen this boat on and off for the last couple of weeks, as they’ve been following the same route as us. We got talking to some people on a river boat just in front of us, and finished up sharing a cheesecake, and strawberries and cream with them, and half a bottle of wine. They were just out for the day from Evesham on Victoria. Very pleasant people. 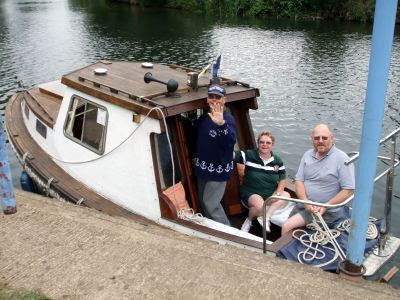 Tony, Jackie and Roger leaving for Evesham. Photophobic Beryl is hiding inside. A longer day than planned today, but that means we can have a shorter one tomorrow. 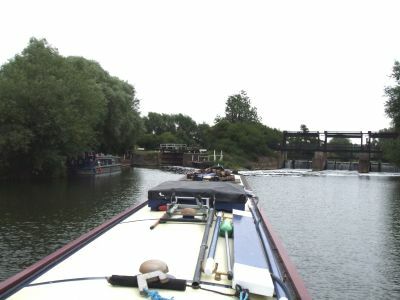 Just heading into Evesham, four miles and one lock away. Day 1 on the Avon. 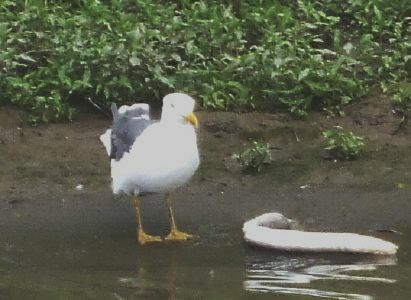 Know why there are so many River Avons knocking about? Avon is the Anglisized version of Afon, Welsh for river. Though why this one Welsh word crops up so frequently across the country is beyond me. So, welcome to the River River…. Our first day on the river hasn’t been very auspicious. Low grey skies, a cool breeze and spatters of rain don’t show the river at it’s best. Still it’s better than 3 years ago – where we moored last night was under water then, linked to the Severn with no sign of the lock or The Ham where I walked Meg this morning. Some excellent aerial shots here. Leaving the Avon Lock moorings today. 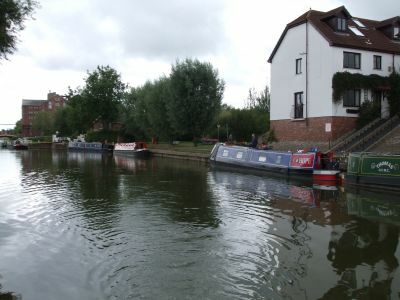 Tewkesbury Marina and it’s rows of moored boats is the last you see of the town. 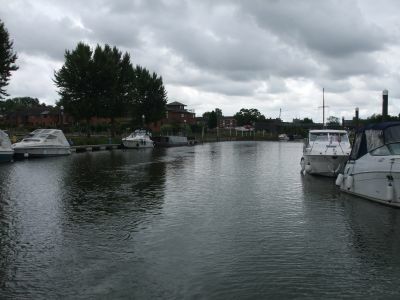 Tewkesbury Marina. The river widens as it escaped into open country, remote from any roads and buildings for a couple of miles, before making a sharp right turn at Twyning. The Fleet Inn must be a popular spot at weekends, situated where it is. The Fleet Inn, Twyning. Pity about the moorings, though. The M5 crosses soon after, intruding into the peace and quiet. Bredon Hill is on the left, the pointy thing on the extreme right is the spire of St. Giles’ church in Bredon. 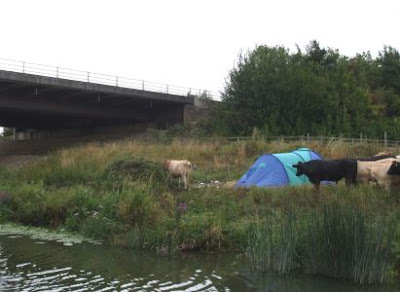 Just below the bridge there’s a couple of tents, surrounded by bullocks. The river is popular for sailing, with a couple of clubs passed on today’s trip. 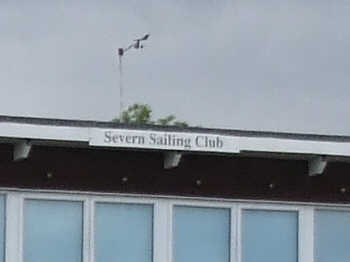 This one’s the Severn Sailing Club. 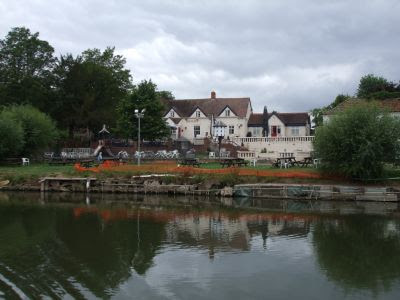 Maybe they should swap names with The Avon Sailing Club, near the Yew Tree Inn downstream on the River Severn…. 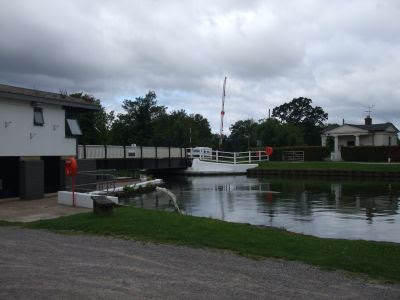 Our first (and only) lock of the day was at Strensham. There was a boat coming out and one ahead of us waiting to go in, so we joined them. We’ve got to use a different technique on the river. Normally a centre line (or nothing at all!) 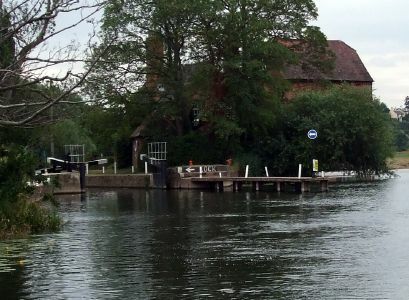 suffices to hold the boat, careful adjustment of the ground and gate paddles preventing too much movement. But here the Bye Laws clearly state that fore and aft lines must be used. 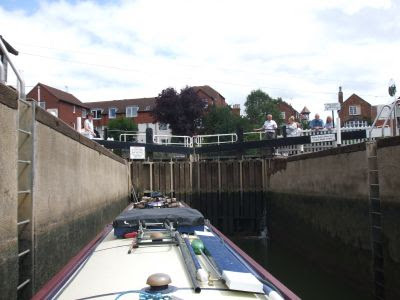 Most of the locks have gate paddles only, which cause considerable turbulence if opened with too much enthusiasm. So Mags holds the stern in with a rope around a bollard, while I control the bow and wind the paddles. Unlike on BW waters, the gates are to be left open when the lock is exited. You’d soon get shouted at if you did that on the Trent and Mersey! 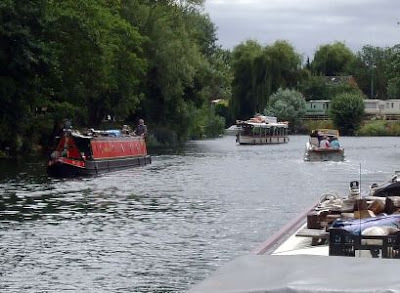 As this is a river rather than a canal, crossings are a lot thinner on the ground, and consequently tend to be busier and older. 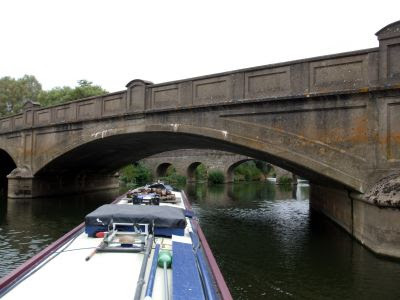 The bridge at Eckington was built over 400 years ago, the red stone mellowed by age. 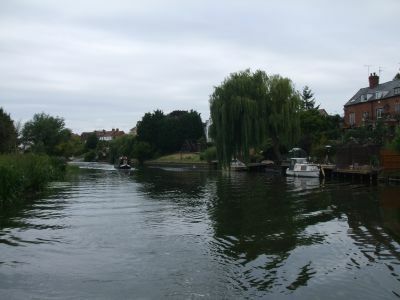 There’re moorings provided just upstream of the bridge, but there’s a car park alongside and the road above is quite busy, so we pushed on another ½ mile to Swan’s Neck, a tight, almost 180°, turn. There’s a Seyella sized bit of bank here, grandly known as Birlingham Quay. That’ll do us for the night. Strange, this internet stuff. 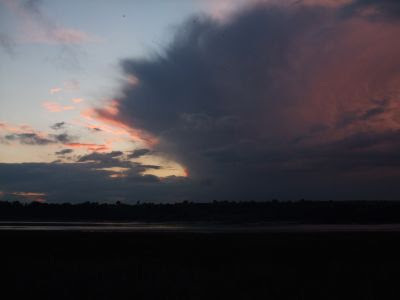 Yesterday evening, on the edge of Tewkesbury, I spent 2½ hours posting on a very unreliable GPRS connection. Today I’ve got a good, stable 3G signal miles from anywhere. If you're on the canals between Oxford and Foxton in the next three weeks, keep an eye out for this pair. I hope the weather improves a bit for them. We had a couple of quiet nights on Baker’s Wharf, next to Llantony Bridge. 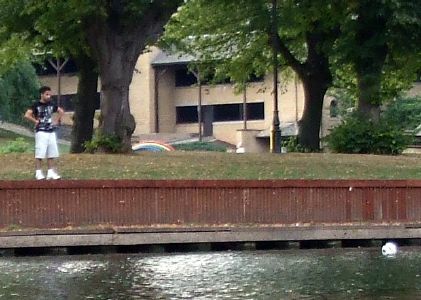 This pontoon mooring is on the offside and the offices alongside are not in use, so there’s no pedestrian traffic going past. It’s handy for the town centre as well, although that’s a bit chaotic at the moment, dust and noise as some roads are pedestrianised. This morning dawned beautifully, bright blue skies and a warm sun at half past six. But the clouds rolled in again before we left. I managed to get these shots before the light died, though. 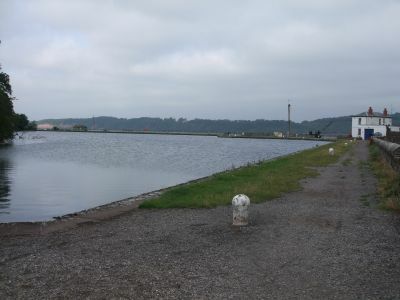 Panorama of the docks from Llantony Bridge. Look how still the water is…. Llantony Priory We were away through the lift bridge at 09:00, straight into the lock across the basin. I’d given the lockie a call, and he’d set up ready for us. We dropped down in company with NB Forget Me Not. We’d met Dave and Ann and their two terriers further up the canal, and they caught us up here last night. They were going up to Upton, though, staying on the Severn where we turned off to Tewkesbury. Leaving Gloucester on the East Channel, Dave and Ann on Forget Me Not following. 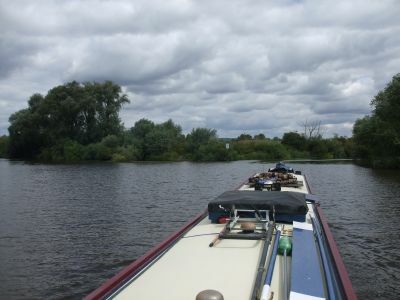 The winding, fairly narrow East Channel takes you back onto the main river at Upper Parting. The West Channel leads down to a weir and a derelict lock, beyond which is the junction to the Herefordshire and Gloucestershire Canal. 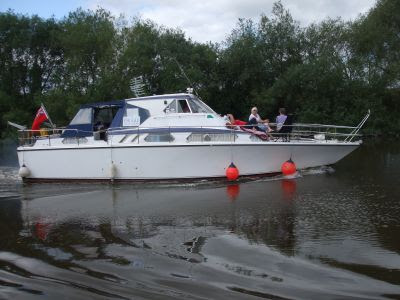 This is another navigation built to take advantage of the excellent trade route that is the River Severn. 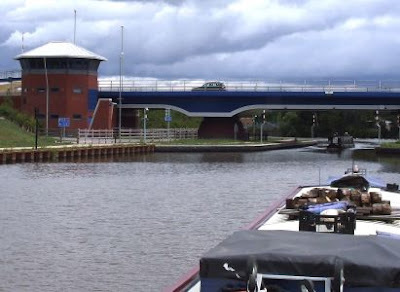 34 miles and 20 narrow locks took boats to Hereford, but it was short lived, opening in 1845 but becoming a casualty of railway expansion in 1881. 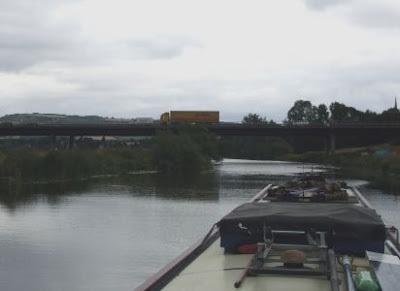 But it looks like restoration and reconnection to the main network via the River Severn is a possibility, thanks to the hard work of the Herefordshire and Gloucestershire Canal Trust. 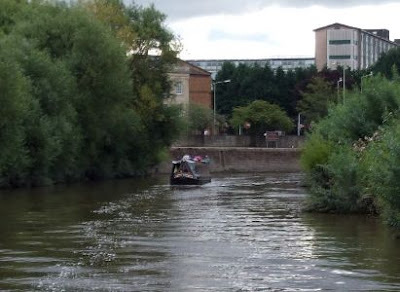 We had an uneventful trip back up the river to the Avon confluence just outside Tewkesbury. The river wasn’t very busy, half a dozen boats coming down, and just one overtaking us. 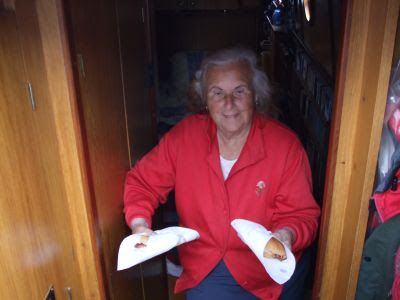 We had an early lunch on the move….bacon butties, excellent. And this guy was enjoying his as well. I think I prefer mine, though. Raw eel, anyone? 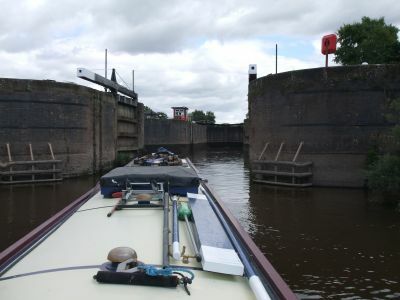 We were cruising comfortably at 1100 rpm, recording 4¼mph on the GPS, so made Upper Lode Lock by noon. This chamber is huge, with a bowl-shaped section at the downstream end. 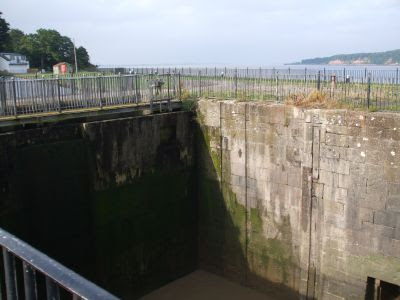 Originally divided by a third set of gates that have been removed long since, it was designed to pass a tug and a train of barges in one go. The whole chamber is used now, and we were a bit dwarfed on our own. We’d left Forget Me Not behind. Shortly after Upper Lode we turned into the River Avon, and arrived at Avon Lock just as the keeper knocked off for lunch. 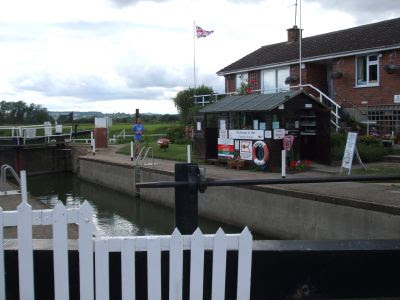 At 2 o’clock, when he came back on duty, the lock-keeper gently brought us up the 6 feet or so to the Avon river level, while politely relieving us of £45 for a 7 day licence, £3 for an overnight mooring above the lock and £6.50 for a new guide to both the lower and upper sections of the river. In Avon Lock. I’d had a rummage through the archive and found an old guide to the Upper Avon, but thought it best to get a bit more up to date. 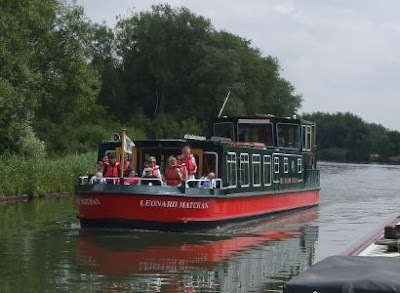 It must be over 20 years since we were last here, doing the Avon Ring on a hire boat out of Evesham. This is the last lock we’ll have done for us, now the work begins! Where did I put that windlass? 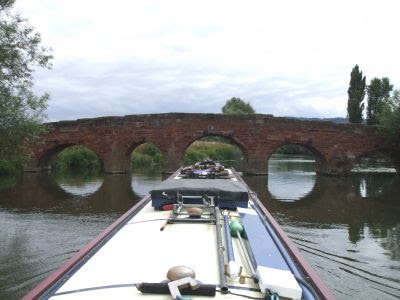 And so back to Gloucester…..
We had a pleasant weekend moored near Splatt Bridge. We’d had the mail sent to the PO at Frampton, so picked that up on Saturday, along with a bit of shopping from the handy general store. A regular visitor for bread. 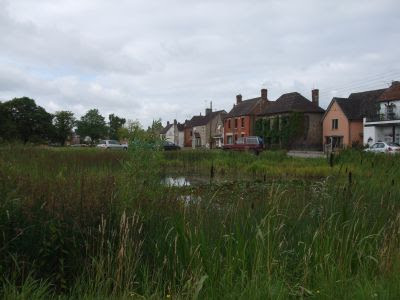 Frampton on Severn is an old village, predating the canal by 800 years. It has a restored 17C tithe barn, 14C church, and what is probably the longest village green in the land. Looking across one of two duck ponds on Frampton Green. It’s been a busy weekend out on the water, the fine weather fetching the day trippers out in droves. I’m glad we stayed put. 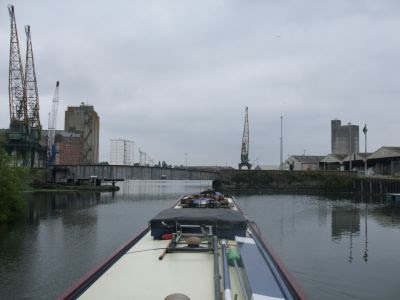 We moved off this morning, doing the 10 miles to Llanthony Bridge at Gloucester docks in one go. Well, one go with 4 stops on route. We’d filled up with water at Saul on the way down, and found it to be a busy spot with a very slow tap! So we filled up next to Fretherne Bridge instead. Fretherne Bridge The original bridge-keepers cottage is on the opposite bank, the modern operations hut on this side. A lot of the single storey cottages are now rented, and not homes to BW staff. The next stop was 200 yards away, at ACP Fuels to fill with diesel. At 71.4p per litre at bit more than we’re used to paying, but we needed it. With higher engine revs on the river and the wide open spaces of this canal, our consumption has gone up by about 5%. Then we pulled in at Saul Sanitary Station to empty the loos and rubbish. Finally we had a couple of hours, enjoying the day and ducking under the bridges that don’t need to be swung for us, before pulling up on the moorings alongside the handy Sainsbury’s supermarket. Rea Bridge. You don’t even have to duck on the counter of a narrow boat. Netheridge Bridge. This is a new bridge, opened 3 years ago to carry the bypass around to the east of the city. Like all of the spans it is designed to open to pass tall ships. Although the smart control tower is a bit of a luxury. It’s probably used no more than once a year. Perhaps as well, It carries a busy road. The canal had to be re-routed, now performing an S bend, to accommodate the new road. Bypass, bridge and new cut details here. 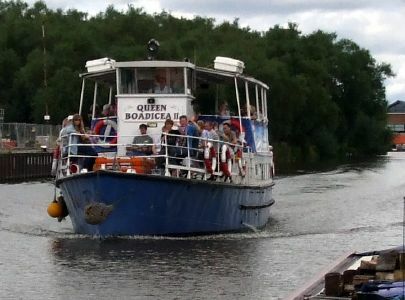 MV Queen Boadicea II with a cargo of day trippers out of Gloucester Docks. 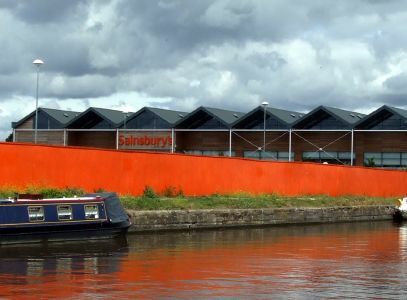 Canal side shopping doesn’t get handier than this. After the shopping we pulled up towards Llanthony Bridge and moored on Bakers Quay, on the offside. 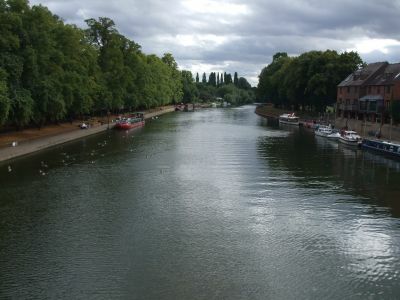 We’ll see what the weather is like tomorrow before committing to our trip back up the river to Tewkesbury and the River Avon. After a couple of enjoyable days at Sharpness we’re heading back up to Gloucester. These were made redundant when the new lock was built in 1874. The old one was too small to accommodate larger vessels as trade increased. 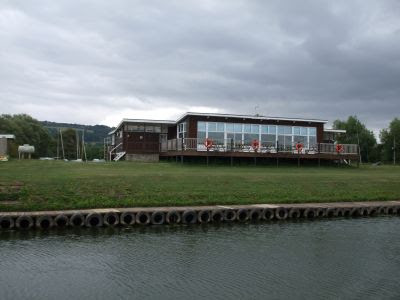 The Dock House is now the area HQ of SARA, the Severn Area Rescue Association. This morning, before we turned around, we had a look into the docks, as far as we could go…. Into the docks, Sharpness Low Bridge in the way. Then back out, bidding farewell to the 14 day moorings with fine views over the estuary. 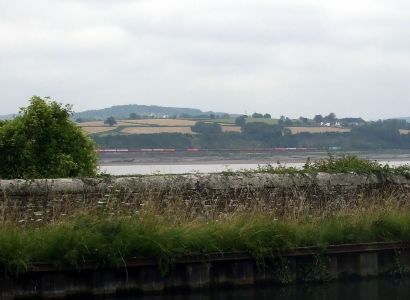 Looking over the estuary, a goods train runs along the Chepstow-Gloucester line, nearly a mile away. Yesterday I mentioned the charity, the Willow Trust. Both of their boats were out on the water today, passengers enjoying the fine weather. We moored just after lunch near Splatt Bridge again. This time though we are on the north side, opposite the church at Church End. We’ll probably stop here for the weekend. On the Gloucester and Sharpness. Not used to this wet stuff! What a difference a day 17 months makes….. Trying to avoid the strimmers!